When it comes to changes in body shape and composition it ultimately comes down to calories in versus calories out. Sure, there are a whole host of factors that tie into this equation and will all affect where your baseline calorie number sits, but ultimately the number calories in (and their ratios) versus calories out is the deciding factor. better macronutrient awareness. You see where your calories are coming from, protein, fat or carbs. greater ability to maximise your calories allowances and potentially eat more food! In my experience, the first 2 points are the big ones, calorie and macro awareness are huge, and a lot of folks are surprised at just how off track (pardon the pun) they are. Thinking you are eating well and tracking to see if you actually are are often miles apart in terms of your accuracy. Here are a few guidelines to help you out and get oyu on your way and help maximise the trackers ability to help you. I use MyFitnessPal as I’ve found it to be the most reliable and consistent. 1 – Starting point – ladies, multiply your weight in pounds (kg x 2.2) by 11 to 14 to get a calorie range, pick a starting point in the range. Gents, multiply by 15-18 and pick somewhere in the middle. Start there. For your macros, this is a good guide to finding your starting macros. 2 – Consistency. You need to consistently track in order to see how close to your target you are. Now, don’t expect to be perfect straight off the bat, it takes time to get into the habit and you will slip up now and again. Don’t worry and get back to it asap. 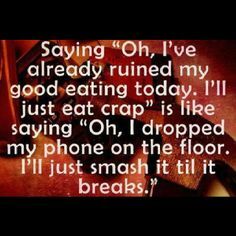 One bad meal doesn’t ruin your efforts. 3 – This is important, you need to weigh your foods, at least initially to get an idea of just how much you are eating, its really easy to over/ under estimate your intake here. – You stay the same. Drop 200 kcals off your target cals and continue at the lower level. Assess and adjust in another 2 weeks. – You lose a little weight. This is ideal, you’re in a small calorie deficit and assuming you are hitting your protein and fat numbers, and strength training, you are losing fat and not precious muscle. Continue with these numbers until things slow and adjust down as needed. You don’t need to track forever, just until you get a handle on how much you need and have a reasonably good awareness of the calorie and macronutrient content of your foods is. It can be a little tedious, it can be a little time consuming, but once it’s done you are on track to you success! Any questions on this or any other topic, please get in touch and I’ll be happy to answer!